Mother’s Day – Sat. 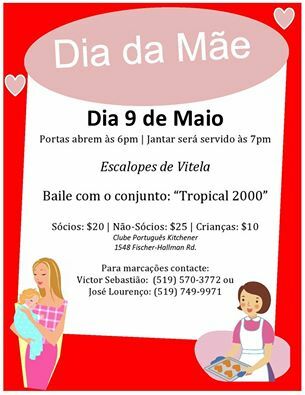 May 9th, 2015 | Kitchener Portuguese Club Inc.
Posted in: Past News and Events. Tagged: $10, $20, $25, $5 at the door, 2015, 6pm, 7pm, 9:30pm, 9th, Children, Dance, Dance Only, Day, Dessert, dinner, Doors, May, Members, Mother's, Non-Members, Prices:, salad, Saturday, Scallopped, Soup, Tropical 2000, Veal. Mother’s Day – Sat. May 9th, 2015 – Kitchener Portuguese Club. Menu: Soup, Salad, Scalloped Veal and Dessert. Dance music provided by the Portuguese-Canadian Duo: “Tropical 2000”.